The specter of short-termism is seen as a major modern evil of the capital market system. In this way it is at the heart of what needs to be corrected in the investment sphere according to the UK regulator the Financial Reporting Council’s new Corporate Governance Code. After the financial crisis Mark Carney, the governor of the Bank of England, put bankers on a warning for short-termism, stating that this focus would need to change if faith in financial institutions were to improve. 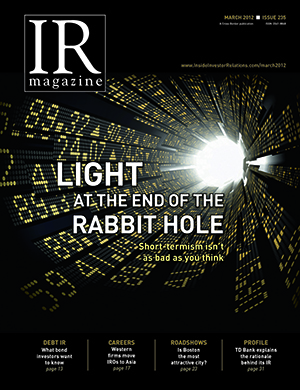 In a similar timeframe analyzing short-termism, the March 2012 IR Magazine attempted to discover whether it was in fact the great weight on the market system, with Neil Stewart’s piece entitled: How bad really are volatility and short-termism? The first point was how things have changed within the market system itself. ‘We’ve gone down the rabbit hole. We’re trying to act as though things have not changed, when all around us everything is completely and utterly transformed and distorted,’ declared Tim Quast, founder of ModernIR in Denver, Colorado at the time. Therefore, for IROs, the portfolio turnover of the world’s active equity managers had steadied to a level below where it was in 2007 – before the US housing collapse and all that ensued. Other concerns have not proved to be accurate, with some experts believing high volatility may be the ‘new normal’, a state the market slipped into some time in the ‘last decade’. A New York Times study cited in the piece found that since 2000, 4 percent daily moves in the S&P 500 have happened six times more than on average in the four previous decades. The corrupting assumption here has not been borne out by time. Nevertheless for IROs frustration had occurred because of record-high correlation, with stocks moving almost in lockstep with indices regardless of their fundamentals. ‘The perception of short-termism is further augmented because the sell side is driving companies toward the highest-turnover investors,’ suggested Adrian Rusling, partner at Phoenix-IR in Brussels. Whether this is still applicable in a post-Mifid II world is open to question. The CFA Institute and Business Roundtable produced a report titled Breaking the short-term cycle in 2006, recommending an end to earnings guidance and a switch to longer-term incentives and, looking back, the surprise is how little things have changed. This last statement could sum up the approach to short-termism very well.